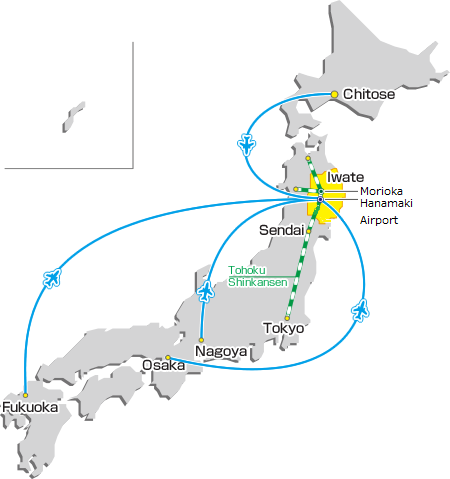 Iwate is easy to get to with a regional airport and fast bullet train access from Tokyo. It's also midway between Tokyo and destinations in Hokkaido like Niseko or Furano so it's an easy stopover on your way to or from other ski destinations across Japan. From Tokyo, you'll need to take the Shinkansen bullet train to access Iwate via the biggest city of Morioka City. From NRT airport, catch the Narita Airport Express (NEX) train to Tokyo station. Departures are frequent with one every 30 minutes or so. Note that reservations for the bullet train can be made at the airport upon arrival in Japan. Consider getting a money saving JR East Tohoku Rail Pass to keep costs down. The easiest way to Iwate from Hokkaido is by airplane. Note that this flight segment is only serviced by Japan Airlines which is currently offering discounted tickets for foreign tourists who want to use this route. Through this promotion JAL is selling this segment for ¥5,400 (about US$48). Make your booking through the JAL site here to lock-in this incredible fare!